It's essential for operators to know how to use forklifts in the warehouse and in other job sites properly. The Occupational Safety and Health Administration (OSHA) requires workers to be in strict compliance with the training standards such as proper forklift use and ensuring workplace safety. As much as forklifts are vital pieces of equipment in the warehouse, they can also potentially cause danger. To minimize accidents and injuries from happening, one must undergo training and certifications from a forklift course. Here a few reasons why there is a need for you to become a certified forklift operator. The Occupational Safety and Health Administration (OSHA), an agency under the Department of Labor of the US, requires operators to be OSHA forklift certified. This law is strictly enforced to promote workplace safety and avoid potential injuries. If caught to be operating without proper training, there is usually a fine of $7,000. However, this can go up to $70,000 if obscene negligence is discovered. Take note that to qualify as a forklift operator, one has to be at least 18 years of age. Failing to adhere to this policy can result in hefty fines. Furthermore, insurance companies may reject claims if the worker doesn’t have a certification, causing the employer to pay out of their own pocket should accidents and injuries occur. According to the claims made by the OSHA and various agencies, roughly 100 deaths a year are accounted to forklift accidents in the US. It doesn't even count more than 30,000 job-related injuries. During a forklift accident ‒ it's not just the operator who can be affected, but other employees in the workplace as well. Thus, to create a much safer work environment for everyone as well as to bring these numbers down, one needs to have relevant training and certifications. It's crucial to note that accidents do not only put the workers in danger but the company’s products as well. Damaged products will always mean significant losses for the company. If equipment are needed to be continuously repaired due to misuse, the losses add up eventually. Forklifts are expensive machines ‒thus, it should be appropriately handled. Proper training is required to avoid this from happening. It dramatically cuts down product losses, decreases accidents, and boosts overall efficiency in the workplace. Employees need to receive training certifications to increase overall productivity. It allows them to be comfortable in handling heavy machinery. In addition, an OSHA certification can help promote safety among workers and gives them the chance to improve their skills. Undergoing training gives them the confidence to operate behind the wheels with fewer risks involved. Undergoing training benefits an individual significantly. It gives them a competitive advantage over other applicants who are applying for the same position. Not to mention, it shows that you’re skilled enough for applying in a position that requires one to operate a forklift. That’s why it's vital that you equip yourself the relevant experience and training on the job. As a result, your superiors are likely confident in your skills and will spend less time training you. On top of that, it also shows how proactive you are. Being OSHA-certified before being hired shows how you genuinely care for the industry, as well as ensuring the safety of everyone in the workplace. This can provide a positive impact to your employers which may be your edge against other job applicants. 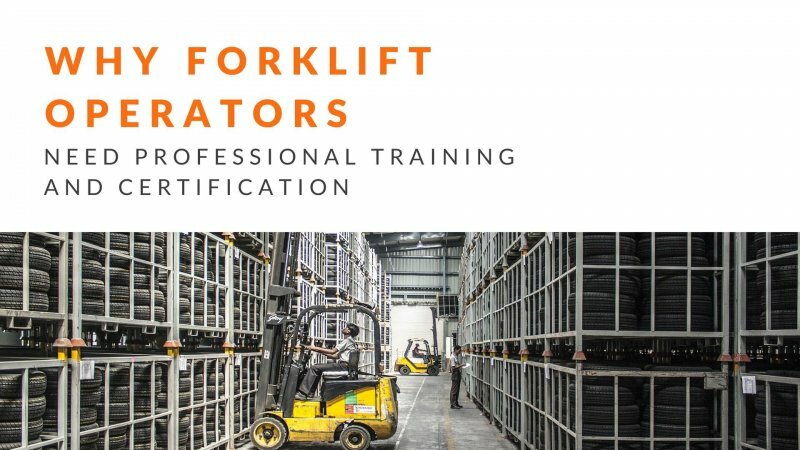 How Often Do You Need to Undergo Forklift Operator Training? Most operators do not need annual training upon earning their certification and may not need to take refreshers every few years. However, the OSHA gives the employer the responsibility of re-evaluating their forklift operators' performance every three years. A company's forklift trainer usually decides whether or not an operator complies and passes the OSHA standards. On the occasion that there are poor performance and evaluations, operators are required to take updated training sessions. OSHA allows workers to retrain in cases of near misses or other incidents took place that threatened safety. It ensures the overall job quality, safety, and efficiency. Whether you're working as a contract employee or a full-time worker, you have the responsibility to comply with the OSHA standards. Doing so will make you much aware of the hazards and risks as well as how to prevent these hazards and risks from happening in the workplace. It maximizes production and efficiency in the company as employees become more confident with their skills over time.